“Nothing is more memorable than a smell. One scent can be unexpected, momentary and fleeting, yet conjure up a childhood summer beside a lake in the mountains; another, a moonlit beach; a third, a family dinner of pot roast and sweet potatoes during a myrtle-mad August in a Midwestern town” (Diane Ackerman, A Natural History of the Senses). 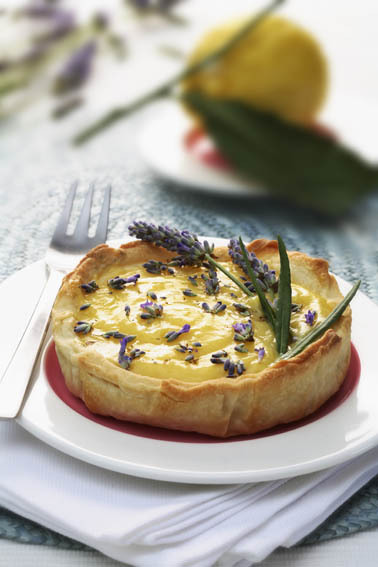 One of my first olfactory memories features a lemon lavender crostata, baked by my grandmother on a summer afternoon about four decades ago. When we think of lavender fields, most of us conjure up images of Provence: maybe because they were often depicted by French impressionists. However, this plant (a member of the same family of savory herbs which also includes sage, thyme, and oregano) is cultivated all over the world, from England to Brazil, from Russia to Japan and new Zealand – and of course, Italy. My grandmother lived in Pistoia, a town about 30 minutes North-West of Florence, and just over an hour drive from the Chianti region and its stunning landscapes of rolling hills lined with cypress trees, vineyards, olive groves and (surprise!) 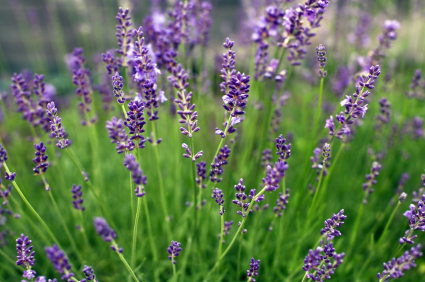 lavender fields, in a patchwork of incomparable natural beauty. That’s exactly where my parents and I used to pick our flowers. Only after a generous tip to the farmer we would be allowed to leave with a large bundle. 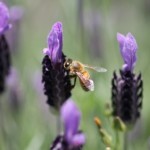 I remember that I would often come back with a bee sting, promptly treated by the local pediatrician, Dottor Federico: lush lavender shrubs are always humming with fuzzy bees, and the product of this romantic relationship is the most elegant of all honeys. 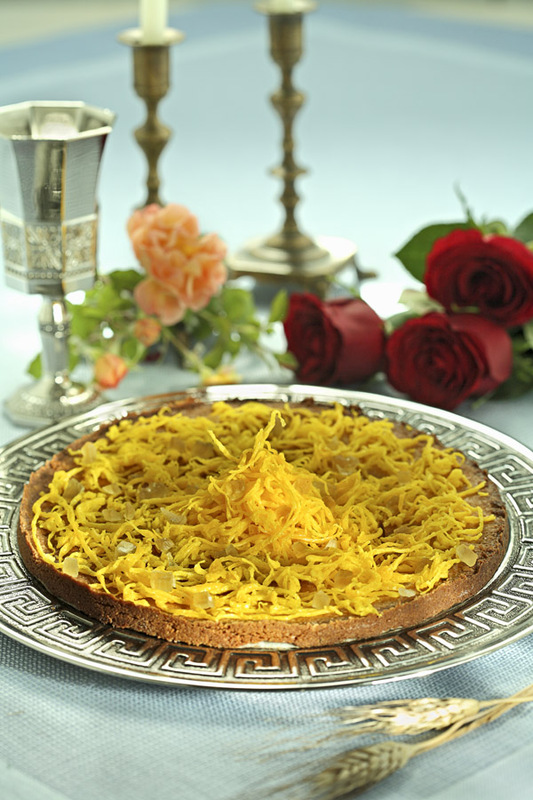 My grandmother was never a remarkable cook or baker, but somehow this particular tart, made using her next-door neighbor’s recipe, and almonds and lemons from her own orchard, always came out so delectable that it was gone in five minutes – however, its exquisite memory has lingered on for over 40 years…. Grease a springform pan (about 9″ to 9 1/2″) and line the bottom with parchment. Preheat your oven to 400 degrees if using puff pastry, 360 if using short pastry. Prepare the custard: beat the egg yolks with the sugar until foamy. Add the lemon zest and juice. Dissolve the potato starch into the warm milk, adding little milk at a time. Once combined, add it to the egg mix. Cook in a Bain Marie over low heat, whisking frequently, until the custard thickens. Add 1 teaspoon dried lavender blossoms/petals to the custard. Pour the custard into the crust, and sprinkle a little more lavender on top. Bake at 400 (for puff) or 360 (for pastry dough) for 30 to 45 minutes or until the crust is golden. 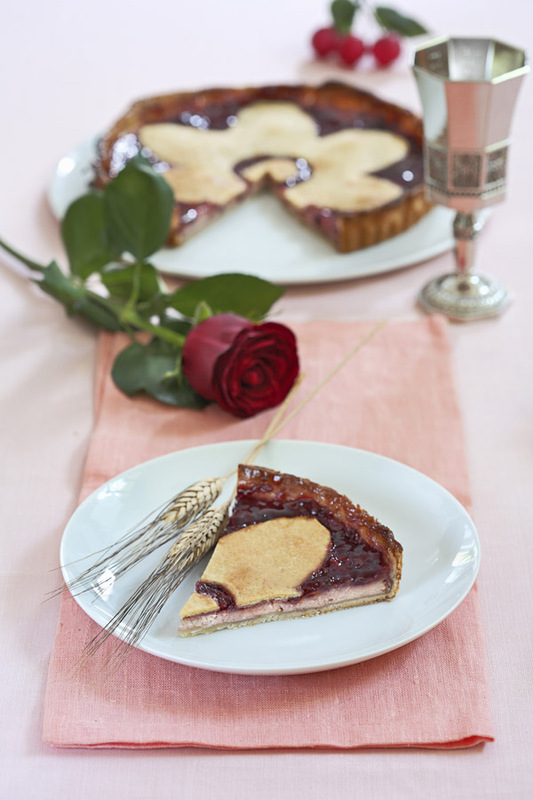 You can also use mini-pans and make individual size tartelettes. 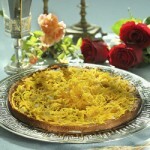 For years, I had been intrigued by this curious cake from Livorno (Leghorn), a dessert that features sweet egg threads on top – a sign that it was introduced by the egg-loving Portuguese Jews and marranos who were invited to settle in the city by the Grand-Duke of Tuscany in the sixteenth century. With the help of the Jewish merchants, Leghorn became one of the most important port cities in Europe (but also a center of the printing press), and became known as “the city with no ghetto”. 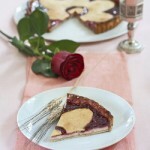 I was already familiar with the local cuisine, and decided to try my hand at this tart, which looked like no other. Unfortunately, the yolk threads proved to be a huge challenge: I didn’t seem to be able to control the flow through the colander (the tool of choice in all the books that listed the recipe). My Livornese friends couldn’t help either: apparently they had always encountered the same problem and ended up with a sticky blob or with burns… they said that they used to buy the cake for Shavuot and for Purim from a well-known patisserie, but that when the owner died his tricks were buried with him. I had to wait until the blogging and YouTube era to figure this all out, with the help of some non-Jewish foodies from Portugal, where threaded eggs are often featured on Christmas recipes… in particular, thank you chef Fernando Canales for teaching me that in the 21st century it would be silly to use a colander when most of us have easy access to a pastry syringe (or at least a large syringe to dispense pediatric drops)! Preheat your oven to 320 F (yes, it’s very low, but if the temperature is higher the “macaroon” will be too crunchy to cut). Place the sugar and water for the base in a heavy saucepan and simmer until sticky (I have also skipped this step and used plain sugar instead of making the syrup, with an acceptable result). Add the almonds and zest, stirring with a wooden spoon until everything is well combined. Allow to cool, and when it’s just lukewarm add the egg. Line the bottom of a 9 to 9” baking pan with wet parchment (squeeze it well) and grease the sides. Pour in the cake mixture and press it down gently with your wet fingertips. Bake for about 30 minutes and set aside. For the egg threads, boil the sugar, water and juice in a frying pan (about 10” wide and with tall-ish sides so the syrup doesn’t splatter all over your stovetop), and simmer until the syrup is thick enough to stick to a spoon (coating it). Slightly beat the yolks in a small bowl and then fill your pastry syringe with as much beaten egg as it can hold. Now press the yolk out of the syringe and into the simmering syrup, starting at the center and moving the syringe in an outward circular motion so that the egg makes a long spiral thread into the syrup. When you are done, press the thread down into the syrup with a wooden spoon or a spatula and let cook for a few seconds, until it holds together (but it should still be soft). Remove with a slotted spoon and dry on a double layer of paper towel. Repeat the same process with the rest of the yolks. When all the yolks are cooked and drained, place them in a colander and rinse some of the syrup off with water. Allow them to dry well. Invert the almond base into a platter, top it with the candied peel and decorate it with the egg threads. It’s worth it! The ancient Jewish community of Rome maintains many traditions that will never fade. 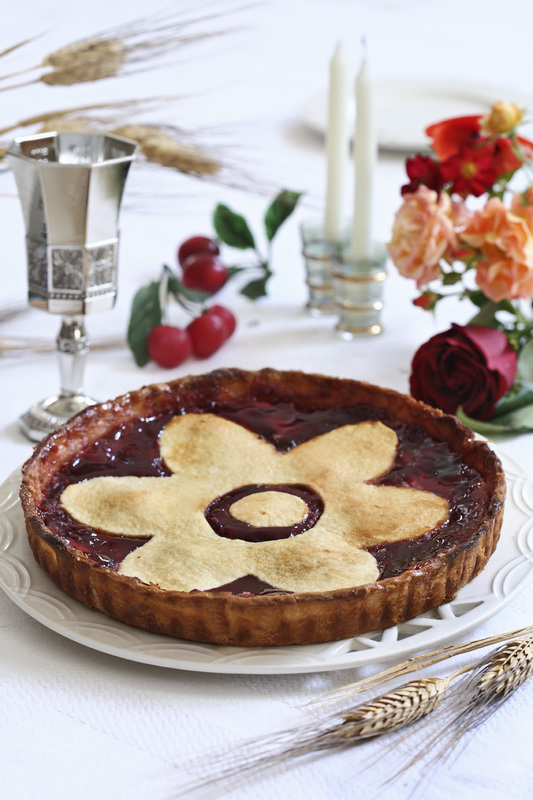 One of its highlights is this double-crusted tart, stuffed with ricotta cheese and sour cherry jam. If you visit Rome, try it at Boccione’s, the famous kosher bakery in the ghetto! Theirs is made with really fresh sheep milk ricotta, and it’s worth putting up with the long lines…. Place the sifted flour and salt into your food processor, add the cold butter cut into cubes, the sugar, salt, eggs, lemon zest, and pulse a few times until crumbly. Remove from the food processor and work quickly with your hands (keep them cold by rubbing them on ice cubes) until smooth. Wrap in plastic and allow to rest in the refrigerator for at least 1 hour. If using fresh sour cherries, cook them (pitted) for 25 minutes on low heat with ½ cup of sugar and 4-5 tbsps water. Combine the ricotta with the ½ cup sugar (and egg and liqueur if using: I don’t). Preheat your oven to 350 F. Grease and dust a baking pan (I also like to line the bottom with parchment as an extra precaution). Cut the dough into 2 pieces: one should be about 2/3 and the other 1/3 of the total volume. Roll out the larger piece on a lightly floured counter and place it on the bottom and sides of the prepared cake pan; brush the bottom with the cherry jam and follow with the ricotta filling. Some people do the opposite and spread the ricotta on the bottom, followed by the cherry jam on top: in this case the ricotta becomes colored by the cherries while the pie is baking. Roll out the remaining dough into a smaller disc and use it to top the pie, sealing the edges (you can also decorate with strips, but the ricotta stays moister if you “close” the pie. I cut it into a large flower shape, which I felt was large enough for this purpose). Bake for about 45-55 minutes.